TP-Link turns its attention to gaming. Gaming routers remain an important segment of the market, with recent entries, including the Netgear XR500 earlier this year and the Linksys WRT32X last year. While a typical router may be standard for some uses, when it comes to the heavy lifting of high quality video and gaming—especially simultaneously—lower end gear will invariably choke under the demands of heavy network traffic. Similarly, while there has been a transition to mesh router kits, which offer better coverage for larger homes, none (yet) are targeted for the gaming market. 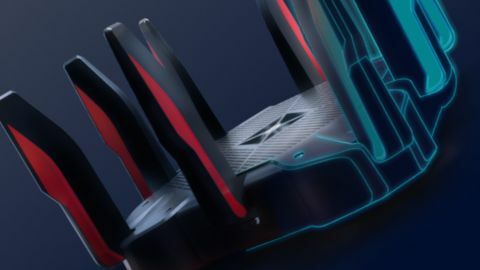 A higher end gaming router can offer higher throughput speeds, better Quality of Service to maintain a video stream while keeping gaming latency low, and more wired ports, among other advanced features. While TP-Link has made some decent routers for the lower and midrange of the market, the company's high end gear has previously been lacking, as they did not target the gaming market with their previous top end router, the Archer C5400. The routers from this company have not done well with prioritizing gaming traffic, relegating them to more general purpose network use (although their recently introduced mesh kit, the M9 Plus is surprisingly capable in this area). One of our favorite routers most of last year was the ASUS ROG Rapture GT-AC5300, with its imposing size, eight antennas, and excellent interface that all cater to gamers. On quick glance, it would certainly appear that the TP-Link C5400X bears quite a resemblance, from the square shape, the eight antennas, and even down to the red accents. So, does that make it one of the best gaming routers of 2018? Setup is smooth, and we like the option that it can be done either via the TP-Link Tether smartphone app or via a web browser interface. Network security has become increasingly important, and here the Archer C5400X has us covered. Right out of the box, there is integrated security from Trend Micro (screenshot above) which includes three functions that can be independently toggled off should the need arise: a malicious content filter, an intrusion prevention system, and infected device quarantine. Also, devices that should not be on the network can be easily blacklisted, or for even more security, preferred devices can be whitelisted, keeping everything else off the network. Rounding out the feature set is an integrated Speeedtest, the ability to enable the router to function as an OpenVPN server which can encrypt the internal network traffic, and parental controls. Overall, the web interface is modern and easy to use, grouping controls into Basic and Advanced areas, with useful and relevant tips available by clicking on the question mark in the upper right hand corner. There are presets available that can automatically prioritize any one of these applications (or none if we select standard), and also a Custom option that allows each category to be set to one of three settings: high, low or normal. (If we had to nitpick, we would like even more granular control across a more continuous spectrum and not be limited to just three toggle settings.) This is what enables you to prioritize the gaming traffic, which is so sensitive to latency issues. Furthermore, while many routers offer priority by the application, or by the device, the Archer C5400X can do them both, simultaneously, a welcome, but rarely seen option in other routers. The only real omission of the C5400X for gaming is the lack of specific technology to lower latency, such as the WTFast GPN approach that Asus takes on select routers, or the Geo-filtering approach to find the closest gaming server as seen in Netgear's XR500. To quantify how all of the features of the Archer C5400X work together, we put it through our benchmark testing (methodology here), and you can consider us impressed. In the throughput department, while the 2.4 GHz speeds of 117.05 Mbps (near) and 112.66 Mbps (far) were middling at best, the 5 GHz speeds of 344.8 Mbps (near), and 347.2 Mbps (far) put the C5400X at the top of the charts. We next turned our attention to congestion testing, while playing Medal of Honor: Pacific Assault (high settings/720p), and simultaneously streaming two YouTube videos on 4K quality. The FPS gets quantitated via FRAPS software, and the Archer C5400X managed 22.6 FPS, which is quite a bit of an improvement over TP-Link's Archer C9 (version 2) router, which managed 16.55 FPS. TP-Link's took their time to enter the high end gaming router market. They clearly benefited from the time honored approach of not being the first out of the gate, but then being better than the competition. Strengths are many, with ridiculously fast 5 GHz throughput, a user-friendly interface with a large library of advanced features, and robust QoS. Weaknesses are minimal: slow 2.4 GHz throughput and a lack of an integrated GPN. The Archer C5400X is available for $399.99, and features a two year warranty.